Last-minute cruises have a definite allure, and it’s not hard to see why. Just the thought of scoring a great deal for a cruise — and paying pennies on the dollar — is enough to get anyone’s interest. And there is good reason to think you can score a great deal on a last-minute trip. After all, if a ship departs with an empty cabin the cruise line makes no money. Since passengers often spend hundreds of alcohol, excursions, and souvenirs, it makes sense that cruise lines would want ships as full as possible — even if it means slashing prices as the trip nears just to get people on board. The truth of the matter, however, is that while you can find some deals, you shouldn’t expect to find dirt-cheap last-minute cruises. After all, if the cruise lines got in the habit of cutting fares days before a trip left, then passengers would wait to book their trip and get the best deal. Cruise lines want the ships booked early so that they can better plan for the trip and for their financial well-being. In other words, you won’t find that $1,500 per person cabin on sale for $500 just by waiting until the ship is about to leave. However, there are times when cruise lines have trouble filling up staterooms and you can find deals that make booking last-minute worth your while. To help you get a leg up, we’ve rounded up some tips on how to get the best deal possible. First things first, let’s dispel the idea of buying a cruise at the last minute means heading to the port, purchasing a trip, and then immediately boarding the ship. In fact, usually the shortest timeline you’ll see is about 5-7 days between when you can purchase a cruise and when you set sail. Yes, you may occasionally find one that departs sooner, but it’s pretty rare. So instead of last-minute, think “last week” cruises. Cruise lines hire a lot of smart analysts to figure out the perfect prices to fill a ship at the highest prices possible. That means they often get the ships filled before having to resort of slashing prices just before the cruise departs. It doesn’t always work out, so you will run across some great deals from time to time. That’s why it’s important to be on your toes and be ready to buy if you do find a deal. It makes sense that flexibility is key to getting the best deal. You’ll find the cheapest rates if you are able to sail during “off” times of the year. This is usually when school is in session. With school in session it’s difficult for families to cruise, taking away a major source of revenue for the cruise lines. As a result, they often slash fares during the school year to fill up the ship. Look especially at the time between Thanksgiving and Christmas for the best deals. If being flexible with the date of sailing is important, then being flexible with your cabin type is crucial. If you want to sail last-minute, then you have the choice of cabins that have otherwise gone unfilled. That usually means prime staterooms — such as those with balconies — are long gone. Instead, you will often only have the choice of inside staterooms, which are less popular. That’s not to say you should feel sorry for yourself. If the rooms are tough to fill this late in the game, that usually means they will be going for cheaper prices. Last-minute travelers living in the middle of the country are at a distinct disadvantage. That’s because in addition to finding a deal on a cruise, people flying to the cruise port also have the hurdle of finding cheap airfare. 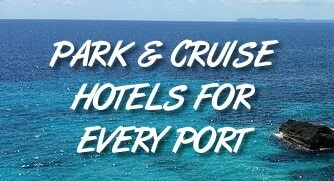 It’s much easier if you live within driving distance of the cruise port, giving you the opportunity to hop in the car to get to the ship instead of booking expensive airfare. While we suggest searching aggregation sites that search all cruise lines to find deals quickly, it’s also smart to sign up for the email alerts offered by individual cruise lines. These lists can alert you to special fares and deals that might otherwise be missed. As well, they can serve as a reminder to hunt around for last-minute deals. An 11-day cruise? A Transatlantic one-way trip to Europe? You can often find great deals on cruises with unusual itineraries because the demand for such trips is low. After all, how many people can take a one-way cruise to Europe, no matter how inexpensive it is? With these trips you can not only find cheap deals close to the departure date, but you’ll often find that there are plenty of choices for staterooms as well. With the craze for last-minute cruises, there are a number of websites that cater to this niche. Often their prices sound amazingly low or they might offer big perks like staggering amounts of money as onboard credit. Our advice to is use common sense. If a website doesn’t seem reputable, then you are better off trying to find a deal somewhere else. And above all, remember that age-old advice: If a deal sounds too good to be true, then it probably is. Have more tips for finding a last-minute cruise deal? Let us know in the comments below.